So yeah you probably saw my thread on the other forums but I just wanted to share this awesome photo by my friend Scott Chu for AG Wheels. Still waiting on more photos from this shoot but I know he's a busy guy. 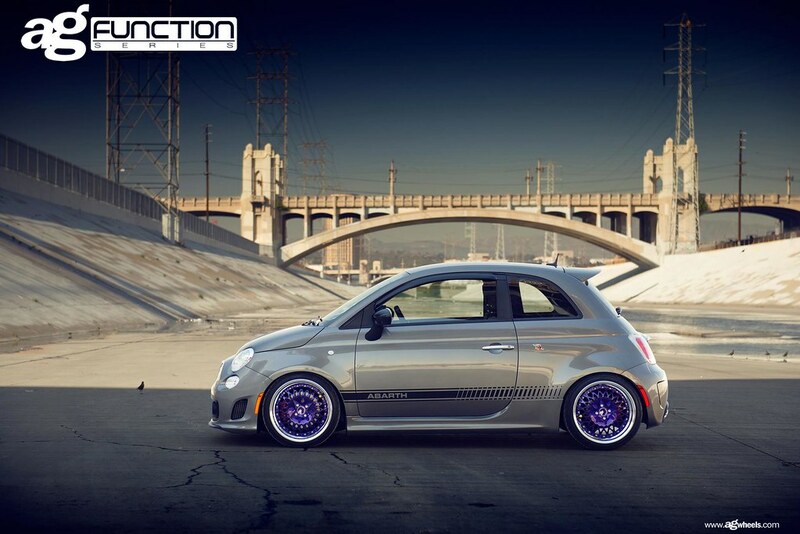 Hands down hottest grigio abarth on this forum. 2013 Abarth, Grigio, Red Caps & Stripes, 17" Black Wheels, Nero & Rosso Interior, TomTom, FlashTech HID Headlight Kit, FlashTech LED Dome Bulbs, Compact Italian Air Horn, Craven Red Stubby, Neuspeed 28mm rear torsion bar, Flash Products Trunk Strap, Flash Products Cargo Straps, extra set white 17" Abarth rims with Dunlop ZII tires. Maybe it's all the other shades of gray in the picture's composition; the concrete in the shade, the concrete in the sunlight, and the lower part of the horizon, or maybe it's because the photographer used a filter that monkeyed with the colors, but the Grigio in the picture looks at least 2 shades lighter than my Grigio (sitting in the driveway right now in full sunlight). Thanks everyone. Monday is another day to have some parts test fitted and installed hopefully. I'm going to route of making the exterior different and then probably follow up with some go fast parts....I only want engine mods because now I've already committed to modding the car. >____< As for the color...yeah it's altered in the photo in post. The car was in shade so this photo was a composite. Nice wheels and perfect drop! You make me want to put coilovers on my car by posting pictures of your car. NoJeebS?? I'm talkin' about MOREJeebS!